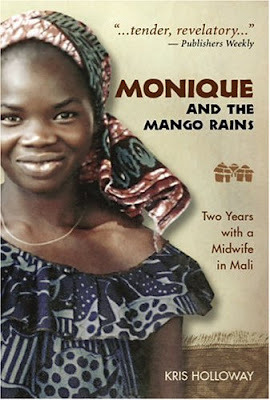 My book club is reading Monique and the Mango Rains: Two Years with a Midwife in Mali by Kris Holloway and John Bidwell. I haven't started it yet but it looks so interesting. Here is the description from Goodreads. Monique and the Mango Rains is the compelling story of a rare friendship between a young Peace Corps volunteer and a midwife who became a legend. Monique Dembele saved lives and dispensed hope in a place where childbirth is a life-and-death matter. This book tells of her unquenchable passion to better the lives of women and children in the face of poverty, unhappy marriages, and endless backbreaking work. Monique's buoyant humor and willingness to defy tradition were uniquely hers. In the course of this deeply personal narrative, as readers immerse themselves in the rhythms of West African village life, they come to know Monique as friend, mother, and inspired woman.